Number 4 in the worldranking 2010! Now everything is checked by timekeepers I can put (at last) this picture on my blog. 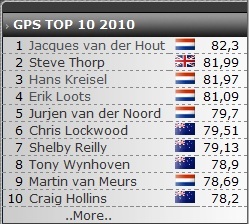 I am at this moment number 4 in the 2010 gps-speedsurfing world!!! Again many thanks for all positive reactions, all the links to speedsurfingblog.com definitly going to help promote speedsurfing ever further!!! I just read the Dailybits blogpost all these links together with windsurfing.nl, facebook, linkedin, fox-sports.nl and many others are worth a lot. Severne Reflex 5.6 + Severne Enigma 400, downhaul till looseleech was at the vertical black-white stripe. 2 Reflex battens on good tension (just without extreme wrinkles around the tensioners), back battenparts totally loose. Topbattens loose, bottom 2 battens mediocre tension (I always do this on any sail/mast the first time to prevent breakage on first session). Outhaul a bit negative. Congratz! Great achievement. The sponsor deal was a good investment for Starboard and Severne :-). And with the autumn and winter coming up, there is still a lot of time to improve your record for 2010.